We are getting ready; cutting kits, finishing samples, dusting off the displays. The Plano show will be here in 2 weeks (August 15-16). Don't forget you can get your advance tickets for $7 at Happiness Is...Quilting! Come on by and say 'HI!" You'll have fun and learn how to applique by hand in this class with Timi Ann. 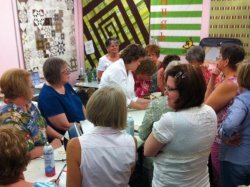 If you have thought about taking a class on hand applique, here is your opportunity. Class is Tuesday, Aug 12 at 10-3. Don't forget to stop in and pick up your free Row By Row Experience pattern. 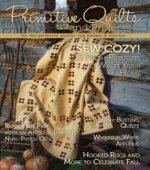 Our patterns and kits in high demand. We are still cutting kits an d printing patterns, so don't miss out on our row. We have our HAPI QLTR Texas license plate on order. If you prepay for you plate, we'll send it to you. You still have time to pick up your copy of the row and purchase a kit to win a prize. For rules and more information, visit www.rowbyrowexperience.com.